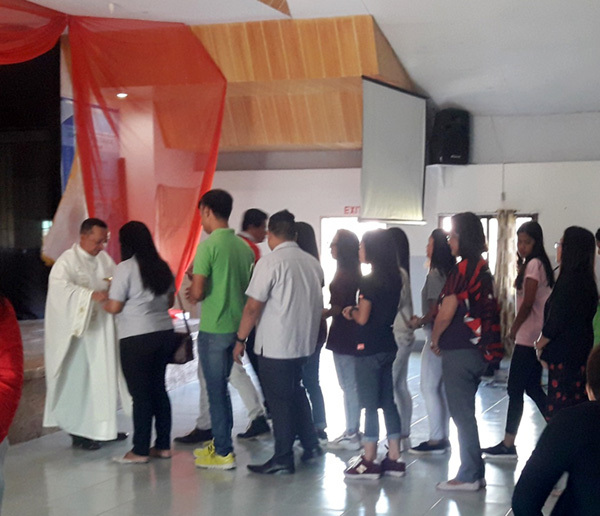 Mario Fungo, Peace Representative of MPPOE Int., Peace Tour 2/14-2/28/19, Philippines. 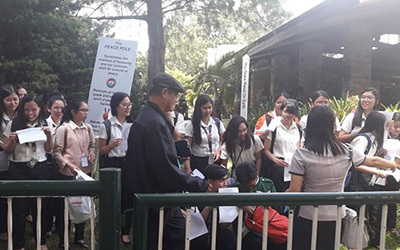 Mario Fungo, Peace Representative in the Philippines, went on a Peace Tour through the Northern Luzon region in February of 2019. He documented his journey with images of Peace Poles, many he helped to plant. 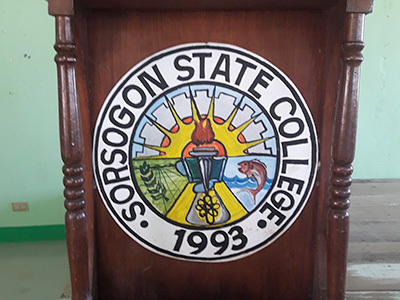 Sorsogon State College, Sorsogon, Philippines. 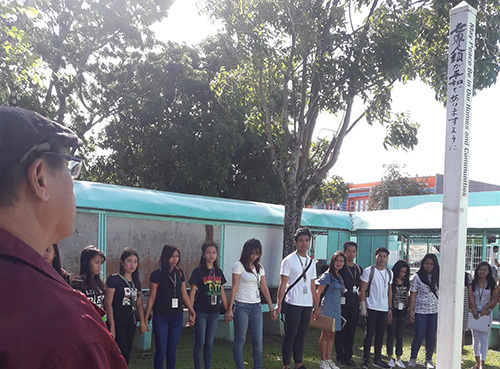 Mr Fungo along with leaders of various student organizations, gathered around the Peace Pole, on Valentine’s Day, for celebration. 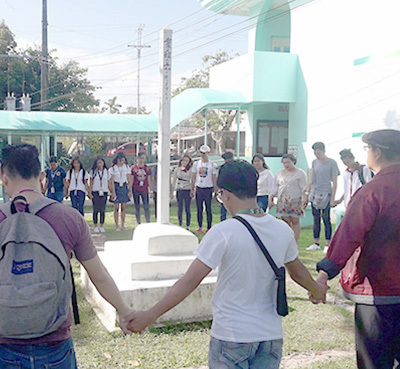 A Peace Pole at Sorsogon State College, Bulan Campus, was installed 11 years ago during a Celebration of Valentine’s Day. Student leaders also termed this as “Green Heart” for Love, Peace and Environment. A Holy Mass is held every February 14th, sponsored by these Organizations and supported by the School Administration. 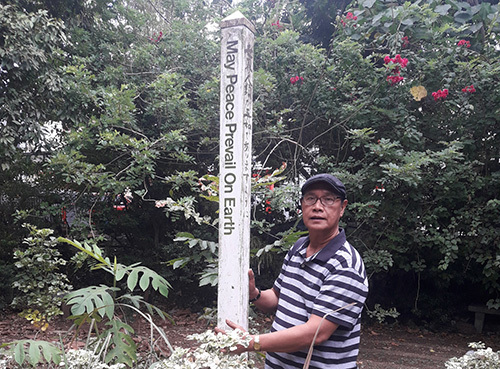 This Peace Pole is in Naga City Ecological Park. 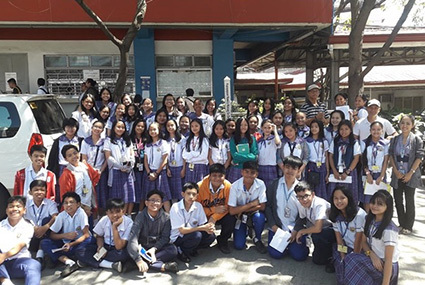 It was planted by a local Women’s Organization, 16 years ago with Mario and the former Mayor Jessie Robredo, who then became, Secretary of Dept. of Interior and Local Government. 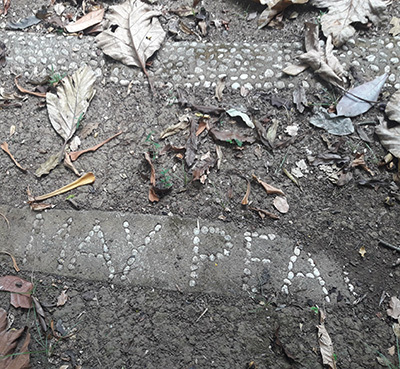 The Peace Pole site is known for its pebble written “May Peace Prevail on Earth” circular form with Bermuda grass in between. Mario unfortunately learned on this trip, Ms. May Palacio, Women’s leader, passed away. May she Rest in Peace. “Two great people who appreciated the meaning of the Peace Pole” Per Mario, together with Mayor Robredo. Robredo’s wife, Leni Robredo is the Vice President of the Philippines. 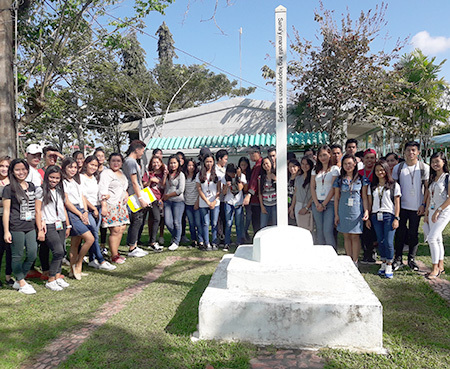 The Peace Pole at Arellano University, (AU) Manila. Mario speaks of how “This was the very first one planted in the school by myself, Akira Ooki and the School’s President 7 years ago”. After the Peace Pole installation there was an agreement signing, solidifying the commitment; “We will continue Peace education at AU, organize and fund Peace related activities.” The University Community Development Office is in charge of Peace Pole’s that are now planted on two more campuses. 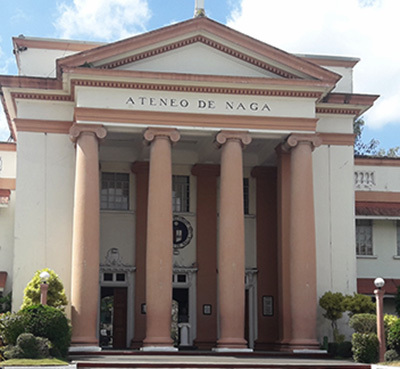 AU has five campuses in all around Metro Manila. 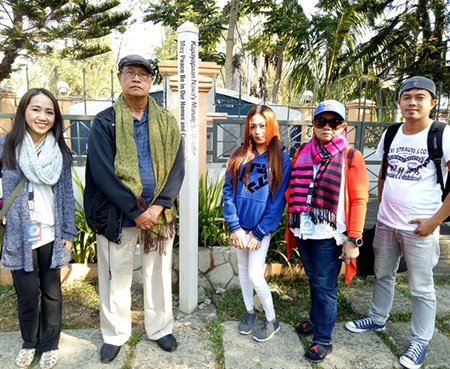 The Peace Pole at La Trinidad Municipal Park. 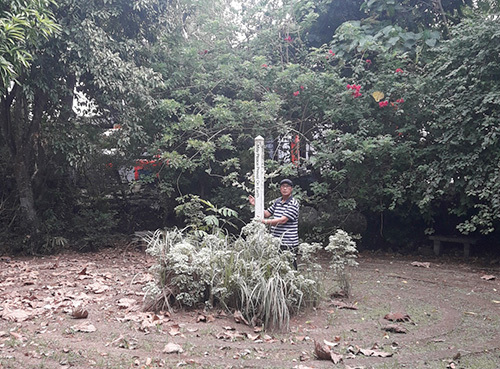 It was planted by, former Mayor, Attorney Betty Lourdes Tabanda as well as Municipal Councillors; in February five years ago during a Non-Violence Week Celebration. La Trinidad Municipal is known for its Strawberry & Flower farming, because of its favorable climate. 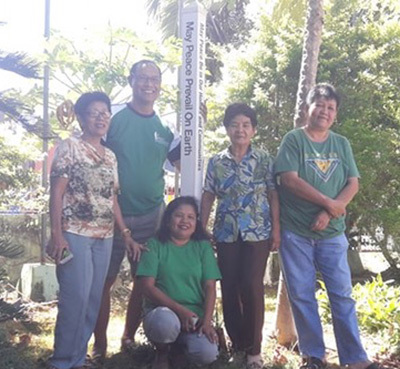 The first and oldest Peace Pole Planted in Santa Magdalena, Sorsogon. It was planted 1993, by a certain Koimaru from Japan, and our first lady Mayor Julieta Frayna. 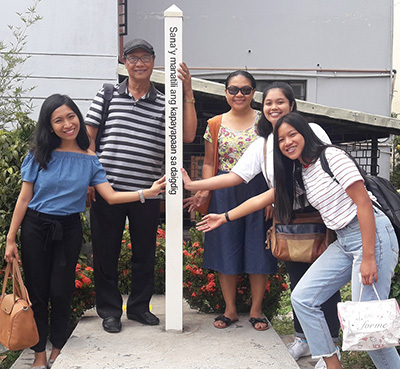 It is also the first Peace Pole published in World Peace Prayer Society’s Booklet, Now known as May Peace Prevail On Earth International. We Thank Peace Representative Mario Fungo for taking this Tour of Peace and sharing his incredible journey. May Peace Prevail in the Philippines. Mr. Mario Fungo, MPPOE Int. Peace Representative.